Cloud-based ERP can adapt as your business evolves and grows. 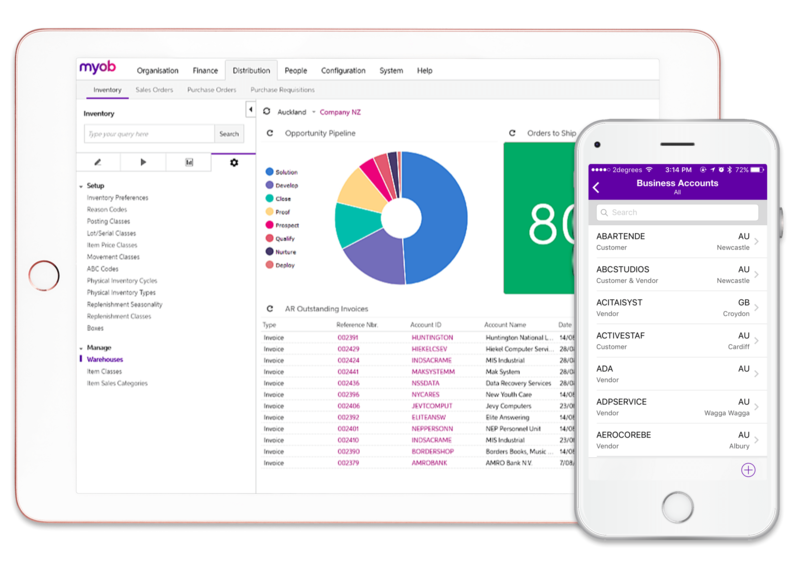 MYOB Advanced is an ideal solution for companies wanting to improve the way they make key decisions: whether it's inventory, sales, purchasing or finance. Endeavour brings our deep experience to ERP to make it work for you. MYOB Advanced is transforming the way larger Australian and New Zealand businesses work. It includes the Advanced Business and Advanced People suite. MYOB Advanced Business is an online business Enterprise Resources Management system (ERP) and MYOB Advanced People is an online HR system. The Advanced Business and People suites deliver an end-to-end business management system that provides ERP and payroll functionality on a single platform. The benefits of this unified system are realised when information flows between functions, reducing duplication of effort, manual data entry and real-time business insights. MYOB Advanced will eliminate hardware costs, giving you a fully customisable platform for a convenient monthly price. And your online data is securely stored, giving you flexibility and freedom to work the way you want. Interested in learning more about how MYOB Advanced can benefit your business? "Advanced's flexibility allows us to cut the data in different dimensions, which means we can be very responsive." "The functionality of MYOB Advanced met our many needs including customer special pricing, advanced stock management, a customer portal as well as CRM," and beyond these features Purcell adds "we definitely wanted the system to be cloud-based." MYOB Advanced Business could do multiple branches, projects, job costing, and just as importantly to GDK, the price was good. "We also liked how it could do consolidated reporting," says Thomas. "We've improved workflow as well as having greater visibility into all aspects of our business, particularly inventory."